Do you already know the basics and just want to find the perfect paddle board? Check out this page to find your next paddle board or check out the best cheap paddle boards if you’re on a small budget. It’s an unbelievable workout. Getting out there for 20 to 30 minutes of consistent paddling will give you an incredible total body and cardiovascular workout. It’s safe and easy to learn. You just need to get your balance squared away, understand a little about weight distribution and stance, figure out which way to hold the paddle, and you’re pretty much good to go. Building on that last point, it’s great for family and guests. If you own a paddleboard, chances are your family members and summer guests will want to try it out. They’ll probably get hooked too. It gives you an unparalleled vantage point on the water. There is no other water sport that lets you stand on while going at your own pace, exploring new areas and just appreciating your surroundings like SUP. There are more benefits, but chances are you’ll find your own reason for falling in love with SUP. It’s not just a fad (please ignore the naysayers.. they’re just jealous). 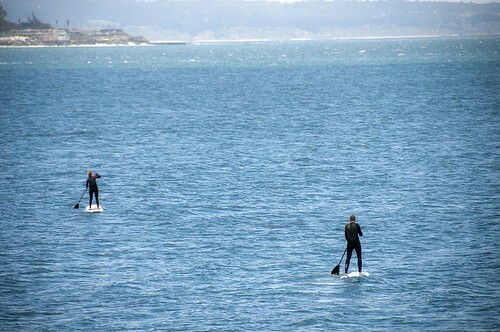 The sport of stand up paddleboarding has been around for decades. And SUP has a rich cultural history in Hawaii. It’s only been recently that SUP has reached the continental USA as a mainstream water activity. Better late than never. The purpose of the SUP Board Guide is to provide a resource on the many aspects of this sport, especially for those of us who are relatively new to SUP. At first the most important aspect will involve finding your first board. This post will hopefully help you with this process. The first board should be something that will let you learn SUP and get comfortable in your own environs and at your own pace. First of all, consider where you will be using the board. Are you planning to use your board primarily in flatwater conditions? For example, if you live near a lake, pond or bay. Somewhere you are unlikely to encounter big surf. These are great conditions to take your SUP board on longer paddles, or train towards a goal of entering your local SUP race circuit. You can always expect a little chop, but for the most part, this board would be designed as an all-purpose flatwater touring board with a displacement bow and good overall stability (See: 5 Great Touring SUPs for entry-level to intermediate paddleboarding). Wider boards will usually add to the stability, as will rails with added thickness and volume. Check out this post for more information on SUP stability. If your aim is to start in the waves, you’re going to look for something with surf board design characteristics. This may include a thruster fin set-up (three fins – one centered, one on each side). A surf or wave SUP will usually be a little shorter and have a planing hull. These boards also often have increased rockers and concaved hulls towards the tail to make it easier to carve in waves. Many of us want the option of taking the board on flatwater cruises and into the small surf. In this case, a hybrid or crossover SUP can be a great choice. 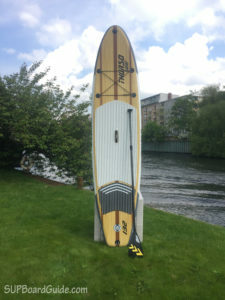 Hybrid and crossovers SUPs sometimes fall into the all-arounder category, where the board description would note the ability to handle waves as well as displacement in choppy flatwater. If you are looking for something to just mess around with – something that will be fun for the whole family – then stick to the all-arounder and beginner boards. These boards are designed for affordable durability, cushy deck pads, and plenty of stability for first-time SUPers. You can find something that has composite construction with a fiberglass or poly shell, or even a plastic board that will suffice for most near-shore stand-up paddling and family usage. In the end, finding the right board all depends on your goals and how much you expect to use the board, the area where you paddle and the type of conditions, and, of course, your budget. 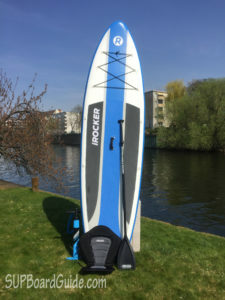 The iRocker Cruiser is one of the most stable options out there. Great for beginners that need a lot of stability or for anyone that wants to bring his/her kids, gear, dogs, etc. Thurso Surf is one of the new up and coming companies in 2017. Their first board is a super sleek looking inflatable that does really well for flat water touring and cruising. Here is my full board review. The BIC ACE-Tec is the third board worth mentioning here. It’s an allrounder hard board that is great for the beginner to intermediate paddler in pretty much any condition. Perfect for families as well. Here is our full review of the board. We’ve already mentioned the displacement hulls in touring, racing, and all-around flatwater cruising boards. The best way to think of this is that they are more similar to a V-shaped hull in a boat. The nose is designed to displace water, and the bottom of the board flattens out a few feet from the nose. This also lets you step back on the board to pop the nose out of the water. Displacement hulls also add to stability for heavier riders. A planing hull is a flat hull, more akin to your traditional surf board or windsurfer design. These are versatile hulls that can be used in most conditions. Although planing hulls are typically not the best choice for a touring or racing board, most of us will be perfectly happy using a planing board as an all-arounder. They also work really well in the surf. These boards can be shorter and wider, with increased volume to make sure they are buoyant and stable. Most board descriptions will include a list of specs. This is important. Pay attention to recommended rider sizes for each board. The specs will usually include a maximum rider weight (i.e. up to 250 lbs). The last thing you want is to start with an undersized board. It will make paddling much harder. Longer stand up paddleboards are generally better for going faster and paddling downwind. These boards will usually range from 12’6″ to over 14′. This is a big piece of equipment, so make sure you’re able to store and transport a board of this size. Longer boards are also better for long distance paddling. Plus, they allow for more space to carry and store gear on your board. If touring and downwind paddling are in your future, then definitely consider buying a longer board. 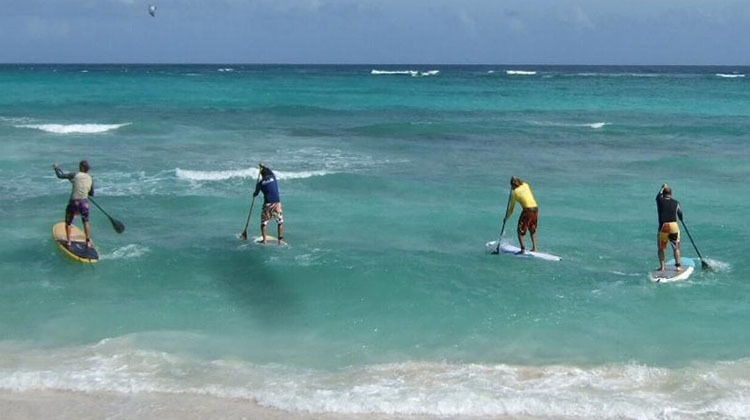 Shorter paddleboards start at less than 9′ and go up to 12′ (although a 12′ board is still very long once you see it in person). They are easier to to turn and maneuver. They are also easier to handle in waves. If you’re a larger rider or worried about stability, make sure the board has sufficient width (i.e., at least 32″). Again, a shorter board is not the best choice if your goal is touring or racing. These will not displace water to make for efficient paddling, and you’ll have a hard time catching momentum on downwind runs. Many fitness boards, crossovers, and family oriented all-arounder SUPs are in the 10 – 11.5′ range. These lengths accommodate many rider sizes and abilities. Boards of this length are also easier to transport, carry and store. Board width equates to stability. For this reason, beginner paddlers should usually look for a board that is designed with wide proportions. This usually starts around 32″ in the waste. Less than 30″ will be a little tippy at first and harder to get comfortable and find your stride. However, narrower boards are also faster and designed to glide better. So it’s a compromise. For most recreational purposes and flatwater conditions, we recommend starting with a wider board. The general guidelines for volume when it comes to beginners is twice the rider’s weight. Volume is often expressed in liters. So we need to do a little math. If you weigh 180 lbs, that is roughly 82 kgs (180/2.2). You would then look for a board with a volume of at least 164 liters. Again, this is the guideline for beginners looking for something with sufficient float and stability. As we noted, board manufacturers will usually give you the recommended weight range in their board specs. But it’s helpful to know about volume, especially if you’re searching for boards in a shop and don’t have the manufacturers specs in front of you. When you’re searching for a board online, it can be hard to appreciate the finer details that some SUP boards offer compared to others. For instance, a very important feature of SUPs, especially for new riders, is the deck pad. Deck pads provide comfort and traction. Many newer boards feature a full-length deck pad. It’s a nice feature, but probably not necessary for most of us. It’s more about the thickness, traction design (i.e. diamond or alligator patterns), and durability of the foam material. If you plan on spending some time on this board, then make sure the manufacturer includes a high-quality deck pad. After a long paddle, with your feet fixed in a certain position supporting your weight, the deck pad will give you much welcomed traction and comfort. It will also make for a nice place to sit or kneel when you need to take a rest. Most (if not all) stand up paddleboards include a carry handle. Otherwise, it would be very hard to wrap your arms around (or carry over your head) a large paddleboard. board against your hip with weight distributed evenly. Carry handles are usually recessed or molded into the board, so they don’t get in the way while you’re paddling. 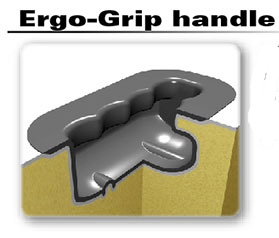 Look for one that is ergonomically designed. They also either use the deck pad material or another soft, comfortable layer to make it easier on your hands. A leash attachment allows you to attach the leash to a stainless steel, recessed crossbar usually located towards the rear or tail of the board. Leashes are great for long-distance paddles and surfing. A more detailed post about SUP leashes is coming soon. However, leashes are not recommended for using your SUP in river rapids unless they have a quick release mechanism. Tie down attachments allow you to use straps or bungees to hold down your gear. Many boards come with the ties in place. These are great for holding a dry bag or pack, especially if you’re covering some distance or using the SUP as transportation to-and-from the mainland. This is the most common type of SUP construction. You’ll see many high-quality boards in the mid-price range using this technology. There are also differences in layering techniques, foam quality and performance enhancements (i.e. carbon fiber and wood stringers). Advanced construction will affect price, but will also make for a lighter, more durable board. Many of the top brands offer boards with EPS/Epoxy construction. Generally, this includes a styrofoam core, fiberglass cloth and epoxy lay-up. Many beginner boards and kayak crossovers are made of durable, molded plastic. While these are heavier boards and definitely less performance oriented, there are more affordable and often great entry-level options. You can find boards like this at big box retailers and large outdoor gear shops. If you’re looking for something the whole family can use without breaking the bank, a plastic SUP is not a bad choice. If you decide to advance to a higher quality board at some point, you will notice a major performance difference in the reduced weight and smoother glide. You’ll find this hybrid construction in BIC’s Ace-Tec technology. 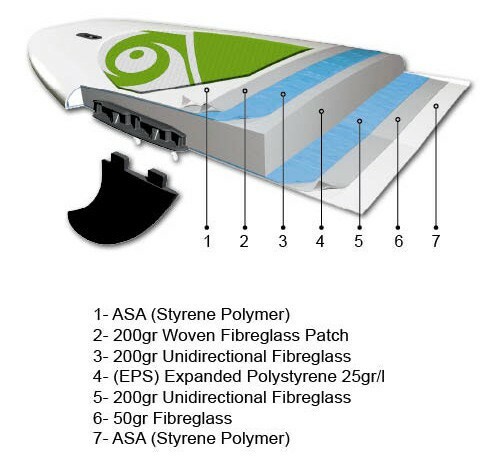 While some refer to these as plastic boards, the construction actually consists of a foam core, fiberglass layering, and styrene polymer outer layer. This makes for a lighter version of straight plastic boards. It’s also a very durable construction technique, which makes many BIC boards great all-around, economical options for entry to advanced level paddling. Inflatable SUPs have become very popular due to their surprising rigidity and durability. This, combined with the convenience of packing the SUP in a duffel bag for your next coastal trip or river run, makes inflatable SUPs an attractive option for many. The key is to find one that is of high-quality construction. Look for double seams and reinforced PVC exterior. They should also have a high PSI (lbs per square inch) range. This should be in the 15 – 25 range. Boards that handle a high PSI will be very rigid, but also able to handle and bounce off rocks and other stationary objects. This especially important if you plan on taking your SUP into the rapids. Let’s face it, nothing looks better on the water than a SUP with a polished wood exterior. These will typically be more expensive though. SUPS that feature wood construction, like the bamboo layered Zephyr from Tahoe SUP, usually incorporate other materials or techniques to make sure the boards are light enough. This may mean the board is designed with a hollow or EPS foam core. 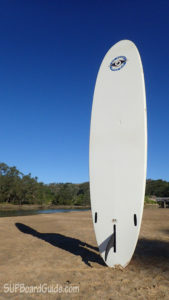 Most entry-level SUP boards come with a standard 9″ or 10″ plastic fin. These are more than adequate for most beginners. However, you can always look to enhance tracking performance by attaching a longer fin. Fins usually come in single or thruster set-ups. Thrusters are 3 fin configurations used with planing hulls. They are better for riding waves. 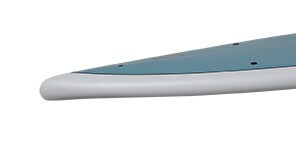 Long, single fins are designed for touring and racing, where tracking becomes more important. Fins are usually either plastic or fiberglass. Fiberglass fins are good for long, single fin designs. We have a more detailed post about fin selection here. SUP fins are attached in the fin box located in the center of the board towards the tail. Most boards come with a nut and bolt to easily secure and remove the fin. This also allows you to slide the fin along the track before securing. 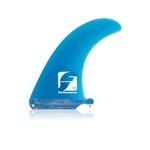 You can position the fin towards the tail for better tracking and touring performance. Moving the fin forward will allow you to turn and maneuver better. Thruster side fins are usually fixed on the outer edges of the board. Many entry-level or all-around SUPs will come with an adjustable paddle. Adjustable paddles are great if you plan on sharing your board with friends and family. sufficient leverage for efficient strokes when in the water. You want something that is lightweight and durable, so finding a fiberglass composite paddle is usually a good place to start. As you become more advanced in your paddling skills and exploits, look for lightweight, fixed length paddles made from carbon fiber or other advanced materials. More advanced paddles will also feature different blade lengths and angles, depending on your focus (i.e. racing and touring versus wave riding). For more information, we also have an entire post devoted to explaining SUP paddle selection. Like any piece of high-quality outdoor equipment, stand up paddleboards can be quite expensive. However, with the increasing amount of manufactures and retailers entering the SUP market, there are definitely deals to be found. Our goal is to feature some of these great values on this site. In general, for someone buying their first board but looking for something from a top brand that will give them a real taste of SUP and will last for a long time, look for boards priced in the $700 – $1400 range. That may seem like a big spread. But keep in mind that boards priced over $1200 can be found on sale in the $900 range. If you’re willing to sacrifice a little on construction or the finer details in durability or weight reduction, you can definitely find a decent board for less than $800. It just takes some research. Buying your first SUP is a big investment. But the returns are definitely worth it. Take the time to research the board and consider where you will be using it. Don’t just buy a board because the shape or design looks cool. You want something that will maximize your time out on the water, not make it a struggle. We hope you can use this information as a guide in researching your first board . . . Or your next board. Check back with the SUP Board Guide for upcoming board reviews with detailed analysis of many of the factors mentioned in this article. Ready to buy your first board? Check out our favorite paddle boards here. What is the best exercise for stand-up paddleboarding? Do can you suggest an inflatable SUP board that I can use as a beginner? Thanks!